This is a quality 1" x 8" backlight manufactured by Spectrum Illumination. It is typically used to image objects in silhouette for measurement applications and feature presence detection. It can also be used as a low-intensity diffuse front light. The light includes a white diffuser, quick-disconnect connector, and a 4 meter cable as standard. This light may be operated in continuous or strobe mode. If used in continuous mode, the light should be mounted against a metal structure to provide additional heat dissipation. Please contact us if you're interested in a different diffuser material, a longer cable, or a custom size light. 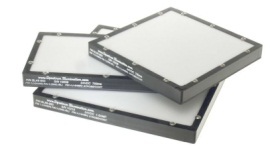 Window: White Diffuser Optional diffusers: Clear cover, thin film diffuser, or linear polarizer.